Spring this year has been crazy–in between the inspiring student protests and the rapidly shifting weather, the whole city feels like it’s in a constant state of flux, unable to settle down into the traditional idea of a peaceful, gentle spring. Today, for example, as the student leaders and government sit down for talks yet again. violent thunderstorms woke me up at 5 AM, the weather was sunny and humid for the morning and afternoon, and thunderstorms began to rage again around the end of the work day, flooding many places and trapping me at work for an extra hour. I had to travel in the rain and even though it was warm, the rain and the mist still made it feel like winter. I wanted something warming and comforting, but traditional winter fare felt like it would be too heavy, and besides, after an unfortunate run-in with rutabaga, I’d had enough root vegetables to last me a while. 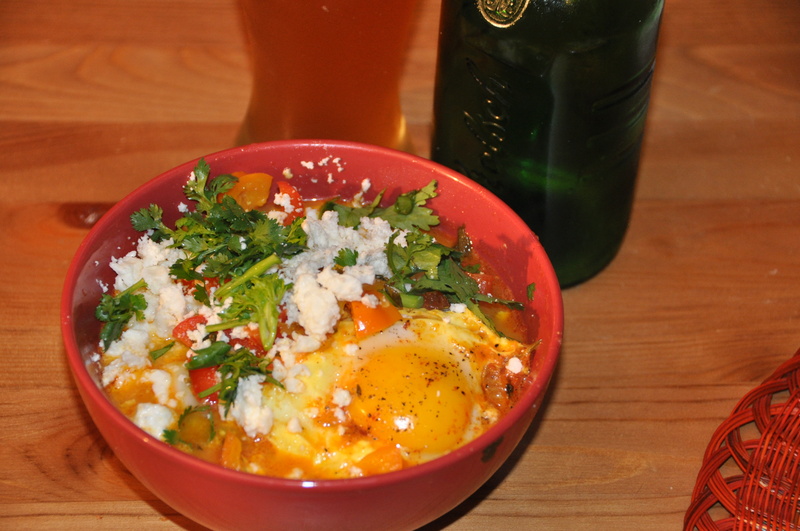 Shakshuka immediately came to mind–it’s an Israeli/North African stewlike mixture of onions, bell peppers, and tomatoes with lots of spices and herbs that you then poach eggs in and eat with crusty bread or pita. It’s filling and warm, but the vivid spices, fresh herbs, and relative lack of grains make it feel lighter and more lively than most stews. 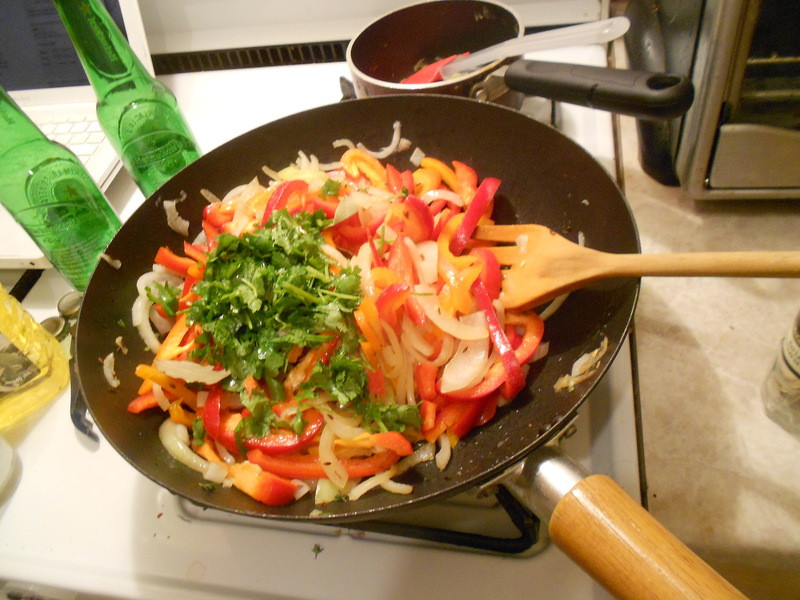 In a large saucepan or wok on medium heat, add the cumin seeds (no oil or anything) and toast, moving them around often, for two minutes or until they start to darken. 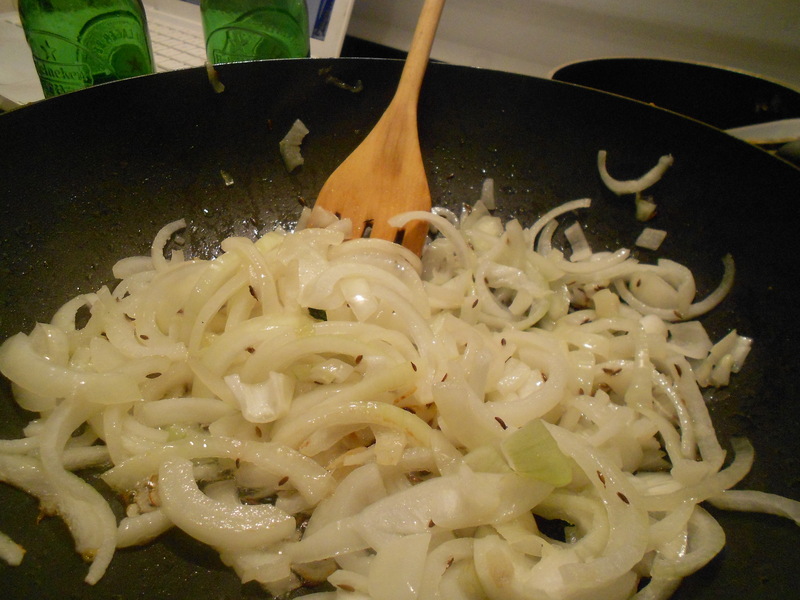 Add the olive oil and the onions and sautee for a few minutes, until onions start to get translucent and soften. 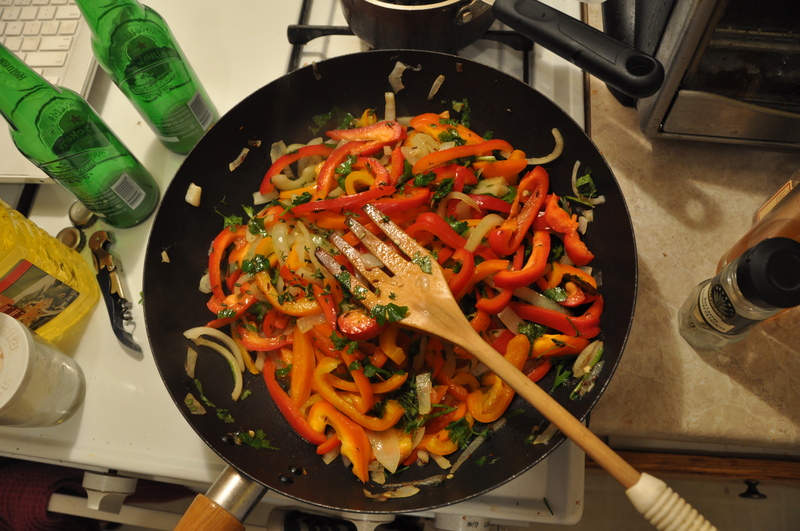 Add the bell peppers, sugar, thyme, parsley, and a quarter cup of the cilantro, and cook for another five minutes, until peppers have begun to soften and onions are beginning to darken. 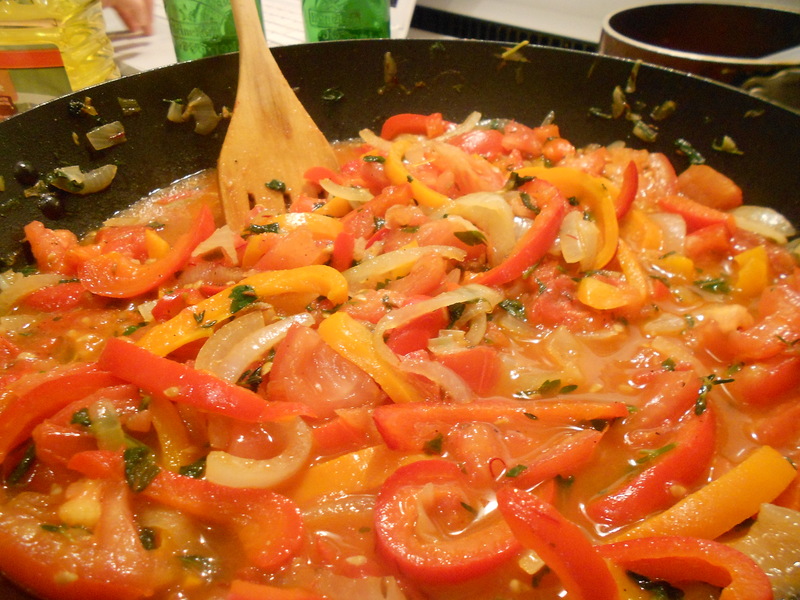 Add the tomatoes, saffron, cayenne, smoked paprika, and salt and pepper. Cook for another 10-15 minutes, adding a bit of water as needed to get the mixture to about the consistency of a pasta sauce. Taste for seasonings, and correct as needed. 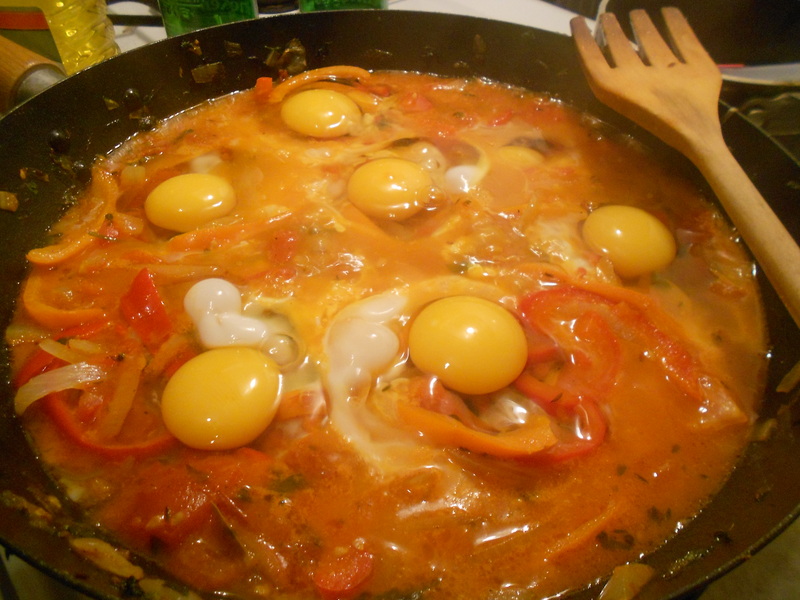 Crack eggs directly into mixture, cover pot, and cook for another 10-15 minutes until set. 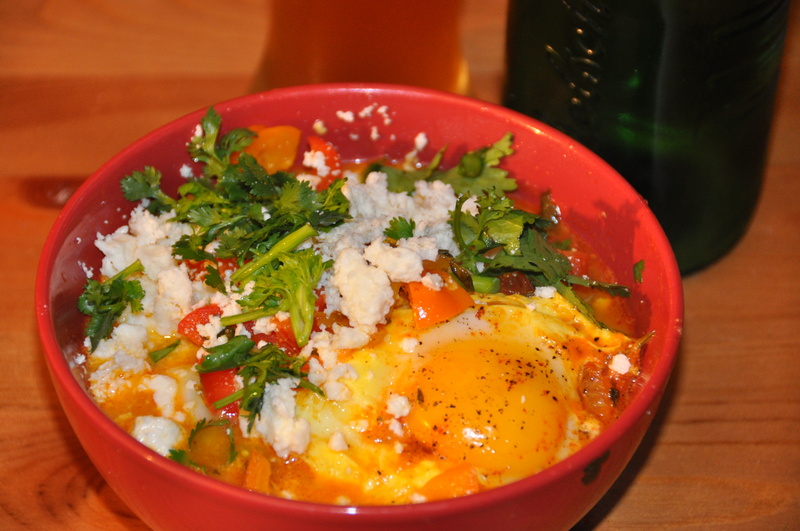 Ladle eggs and stew into individual bowls, and top with crumbled feta and remaining cilantro. Eat by scooping up with bread or pita, and enjoy! Best served with homebrewed white beer, but I think you’ll enjoy it regardless.